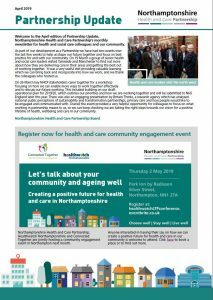 In the April 2019 edition of Partnership Update, you can find out more about a pioneering new digital innovation which aims to improve outcomes for thousands of people receiving domiciliary care, and read all about a fantastic awards night celebrating our county’s health and care apprentices. There’s also news of national funding for targeted lung health checks, an update from our local maternity services and much more. In the March 2019 edition of Partnership Update, you can read all about an exciting new project to help some of our more vulnerable older citizens stay well and live well, and find out which four areas of our county have been selected to develop projects shaping local services around the needs of their communities. There’s also news of a public engagement event on the future of health and care services in our county that’s taking place this spring, plus much more news from around Northamptonshire. 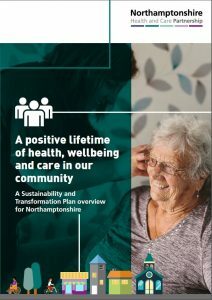 This booklet provides an overview of the work we are doing together as Northamptonshire Health and Care Partnership and why we are doing it. As well as explaining how health and care services operate in our county, the document provides background information about why there is a need to improve the way we do things – and outlines our priorities for a positive lifetime of health, wellbeing and care in our community. 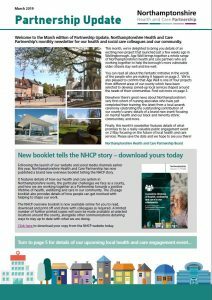 Read Northamptonshire Health and Care Partnership Overview Booklet. 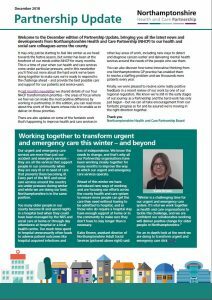 The January 2019 edition of our Partnership Update staff newsletter features the latest news from across Northamptonshire’s health and care organisations. Featured in this edition are details of how Northamptonshire is leading the way with an innovative new nurse training scheme, an update on our plans to shape local health and care around our communities, the launch of the brand new NHCP website and much more. Click the image on the right to read or download the January 2019 newsletter. 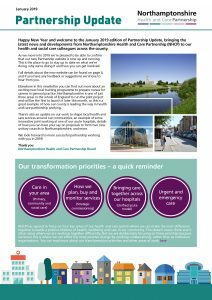 This is the second edition of the Northamptonshire Health and Care Partnership (NHCP)update newsletter for all health and care staff working in our county. 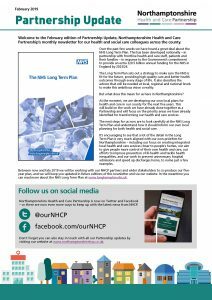 Highlights from this latest edition include the lowdown on our work to get ready for winter, a closer look at some of the teams who help us turn our Partnership plans into action, the story of some innovative thinking on staff recruitment at one Northamptonshire GP practice, an update on the proposed local government unitary restructure and more.